A new trailer for The Predator is coming our way tomorrow. That is, assuming the French Twitter account for 20th Century Fox is to be believed. The account recently revealed a brief teaser for director Shane Black's upcoming continuation of the legendary sci-fi franchise, which has been in the works for some time but is finally coming our way this fall. The text provided with the teaser roughly translates to, "He doesn't have 'a good-luck mouth' but he gives you an appointment tomorrow for the new trailer!" So ready yourselves for some new footage, folks. The first trailer debuted in early May and left many fans scratching their heads. Not only is this movie taking the franchise to the suburbs, but a young kid is responsible for bringing the alien hunters to Earth this time around. Plus, there are messed up army vets trying to hunt them down, a bunch of shady people in lab coats and plenty of imagery that doesn't all add up. It's hard to know what to make of The Predator just yet. Though, an extended TV spot dropped a couple of weeks back which decidedly did a much better job of selling fans on what this movie has to offer. Namely, a massive mega-Predator. 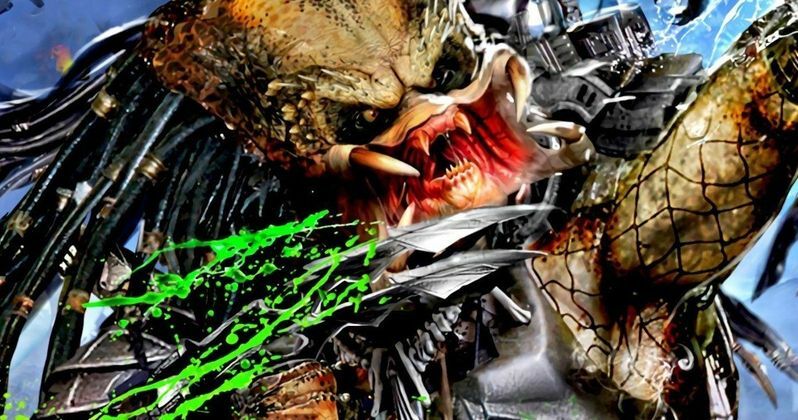 Fox is bringing The Predator to San Diego Comic-Con next month and it seemed likely that they would wait until then to drop the new trailer. So what exactly are they going to showcase during the convention? Maybe they're going to show a lot of extended footage? It's tough to say, but the studio is clearly putting the pedal to the metal in terms of promoting this thing ahead of the September 14 release date. Shane Black, who started in the original Predator alongside Arnold Schwarzenegger and had directed movies like Iron Man 3 and The Nice Guys, is at the helm for this sequel/reboot. Fred Decker (Monster Squad) co-wrote the script with Black. The cast includes Boyd Holbrook, Yvonne Strahovski, Olivia Munn, Trevante Rhodes, Keegan-Michael Key, Sterling K. Brown, Jacob Tremblay, Thomas Jane, Alfie Allen, Augusto Aguilera, Jake Busey and Edward James Olmos. Sadly, it doesn't look like Schwarzenegger is going to make an appearance, unless they managed to sneak him in during the recent reshoots, but that seems unlikely. Don't get your hopes up. As for what we're going to see in this new trailer? One has to imagine they're going to try and make this a more crowd-pleasing presentation. Fox has high hopes that this can reinvigorate the franchise moving forward. Will this be more like Alien: Covenant and be the possible nail in the coffin or will it be more like Jurassic World and reignite the series for a new generation of viewers? We shall see. Be sure to check back with us tomorrow as we'll have the new trailer for The Predator as soon as it's made available. You can check out the new teaser, courtesy of 20th Century Fox, for yourself below.